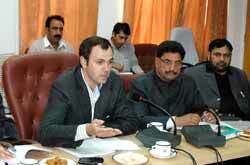 Jammu, March 05 – Calling for a holistic approach to prepare a comprehensive and time bound master plan for the next five years for Mubarak Mandi Heritage Complex, Chief Minister, Mr. Omar Abdullah today stressed on channelizing available resources for the successful implementation of the prestigious project. Chairing the Governing Body’s meeting of Mubarak Mandi Jammu Heritage Society of which he the Chairman, the Chief Minister said that without fiddling with the historic architectural design and façade of the complex, the efforts should be focused on protection of vulnerable buildings on priority. Mr. Abdullah said that an overall view has to be taken to make the project self sustaining and complete it within a prescribed time frame. Jammu, March 05– Minister for Tourism Mr. Nawang Rigzin Jora today informed the Legislative Council that the Chief Minister Mr. Omar Abdullah was very keen to develop Bangus Valley as an international tourist destination, for which a comprehensive master plan was in pipeline. Chairing the Governing Body’s meeting of Mubarak Mandi Jammu Heritage Society of which he the Chairman, the Chief Minister said that without fiddling with the historic architectural design and façade of the complex, the efforts should be focused on protection of vulnerable buildings on priority. Mr. Abdullah said that an overall view has to be taken to make the project self sustaining and complete it within a prescribed time frame. “We cannot work in piece meals and make the project open ended”, he said and asked the Governing Body to obtain the view point of elders and keep in mind the sentiments of the people while formulating reuse plan of the Mubarak Mandi Heritage Centre. “The Governing Body should talk to the elders besides the members of the Society before moving forward in this direction”, he said. The Chief Minister stressed on putting in place a mode of execution of the restoration and conservation project within a time frame taking care of all aspects of the important heritage complex. He underlined the historical significance of Mubarak Mandi Complex and said that the Tourism Department, which is the nodal department for the Mubarak Mandi Complex, should sit with the Society INTACH and other concerned agencies to formulate a comprehensive plan for resource generation and implementation of works programme to achieve the objective of protection, conservation and restoration of pristine glory of Mubarak Mandi Complex. The Chief Minister fixed the deadline of March 31st 2009 for handing over the possession of vacated buildings by various departments to the Society adding that the Department of Information need not be vacated at this point in time as its building does not fall within the complex. “When the construction of outer facade would be taken in hand in the 2nd phase, the shifting of Information Department will come up at that time”, he said. The Governing Body discussed various agenda points threadbare including deployment of dedicated force by the Home Department, stationing of Fire and Emergency Unit in the Complex, budgetary support by the Government, manpower for managing the affairs of the Society, creation of a R&B sub-division for Mubarak Mandi, demarcation of boundaries, shifting of LT/HT lines and shifting of various departments from the heritage complex. Three PowerPoint presentations were made in the meeting by the Indian National Trust for Art, Culture and Heritage (INTACH), Town Planning Organization, Jammu and the Geological Survey of India. The INTACH in its presentation unveiled the salient features of its vision document for the protection, preservation and maintenance of the Mubarak Mandi Heritage Complex. The presentation highlighted national, regional, local and unique historic background of this complex presenting multifaceted architectural style and structure with variety of façade features. The INTACH is preparing draft project reports for 25 components in a holistic vision of one entity. The Town Planning Organization, Jammu and Geological Survey of India in their presentations gave resume of the various aspects of heritage complex. The meeting was attended by the Minister for Tourism, Mr. Nawan Rigzin Jora, Vice Chairman of the Society, Mr. Gulchain Singh Charak, Member Parliament, Mr. Madan Lal Sharma, Director General Police, Mr. Kuldeep Khuda, Financial Commissioner, Home, Mr. S. Verghese Finance Commissioner, Planning, Mr. S. L. Bhat, Principal Secretary to Chief Minister, Mr. Khurshid Ahmad Ganai, Principal Secretary PHE, Mr. A. K. Angurana, Commissioner/Secretary, General Administration Department, Mr. Basharat Ahmad, Commissioner/ Secretary, Finance, Mr. Sudhanshu Pandey, Divisional Commissioner, Jammu, Mr. Pawan Kotwal, Secretary Tourism, Ms. Tanveer Jahan, various heads of the departments and non-official members of the Society including Maj. Gen.(Retd) G. S. Jamwal, Prof. Lalit Magotra, Prof. Zahoor-ud-Din, Prof. M. R. Puri and Dr. Anita Billawaria. Earlier, the Vice Chairman of the Society, Mr. Gulchain Singh Charak welcomed the Chief Minister and gave the resume of the activities undertaken by the Society for the restoration and protection of Mubarak Mandi Heritage Complex. He said the complex symbolizes the rich cultural heritage of the State and its protection and preservation was the need of hour. Replying to a question of Mr. Mohammad Sultan Panditpori and its supplementaries, the Minister said that the incentive scheme for Tourism infrastructure development, already in vogue in J&K would be extended for further six years and paying guest scheme would also be incorporated in the scheme to improve the tourism infrastructure in the State. He said paying tourist guest concept, first launched in Leh, had proved successful and the same could also be practised in other parts of the State. The Minister said that the Union Ministry of Tourism has sanctioned an amount of Rs. 2.31 crore for the development of Bangus Valley as a tourist destination. Under the scheme, various works have been taken up to make the tourist spot more attractive for both domestic as well as international tourists. Mr. Jora said the construction work on Guest Lodge, and improvement of tracks and trails have already been taken up for execution at Bangus tourist site. He said that a tourist lodge at Reshwari-Lawoosa has also been constructed at a cost of Rs 22 lakh, adding that the work on improvement of tracks and trails from Kushtwari to main Bangus Valley was carried out for 3.5 kms length for which an amount of Rs 3.79 lakhs has been incurred. However, the Minister said that the construction work of Aram Gah and TIC could not be started as the Forest Department did not permit its construction on the forest land. He said that the work on these projects will also start after the issues are sorted out with the Forest Department. Responding to another question raised by Mr. M. Y. Taing, the Tourism Minister said that all the major temples and other places of worship of Kashmiri Pandits in the Valley are well protected with round- the-clock static guards, adding that the temples which are not protected with static guards are protected by the local police of the area by effective patrolling. Mr. Jora said that some temples are being looked after by local Pandit communities who have not migrated. He clarified that no encroachment on the places of worship have been reported from anywhere in the Valley. Responding to the supplementaries raised by the Members, the Minister said that Khir Bhawani is being brought on the tourist map and Rs. 8 crores have been spent on the construction of additional accommodation for the pilgrims there. He said that Government is committed to protect the pilgrim places of Pandits in the Valley.